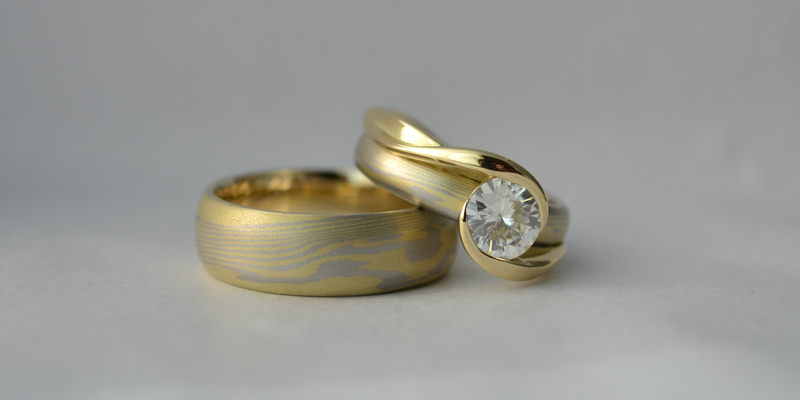 Hutcherson Goldsmithing was established in Portland, Oregon in 2013 by Dustin Hutcherson. Since the beginning, Dustin has been determined to provide the highest quality in jewelry fabrication, design, repair and alteration services through exclusively in-house production. He utilizes both traditional metalsmithing techniques and state-of-the art technology and equipment in his jewelry studio. He constantly strives to keep up with the newest trends in jewelry technology and design. Recently, Dustin’s wife, Caroline, and brother-in-law, George, have joined him to offer other design perspectives. Now, you will find that we offer several design styles from vintage-inspired diamond rings, to simple modern gemstone bands, to graphic character pendants, to realistic nature-inspired engravings. Hutcherson Goldsmithing specializes in custom jewelry design and fabrication. We will work directly with you to create your vision, whether it is just an idea, direction or a fully detailed blueprint. We utilize both computer aided design (CAD) and hand fabrication techniques depending on what is most appropriate for your design. Check out our custom page for more information about custom jewelry. We love bringing your heirloom jewelry back to life. We have extensive experience working on vintage and antique jewelry and will work with you to restore your piece to its original, era-specific style and luster. We can even recreate a lost vintage piece using pictures and your descriptions. Whether you are looking for a ring resizing, prong repair, remounting stones or adding a new engraving you can be confident that Hutcherson Goldsmithing will take care of you with the most attention to detail. We have state-of-the-art equipment in order to be able to protect your jewelry at the same time we can repair it. For example, we have a laser welder so we can resize rings with stones that should not be exposed to heat. If you have been told that it can’t be done by other jewelers, check with us!